Everything about the Szanto Heritage Aviator is big—heavy case, thick crystal, onion crown, chunky strap—with one important exception: the price. The fit and finish on this piece could command twice what Szanto is asking. You’ll need a big wrist—or a big personality—to pull it off, but not a big budget. Did I mention that this is a big watch? The case itself is only 8 mm, but the bezel adds an astonishing 5 mm, and the big domed mineral crystal brings another 2 mm to the party, for a total of 15 mm from case back to crystal top. But that thickness is proportionate with the wide 44 mm diameter. On my 7” wrist, the watch is about as big as I can stand, but it is not garish. The brushed finishing on the case also pares down the visual presence, with just a thin strip of polish on the upper edge. 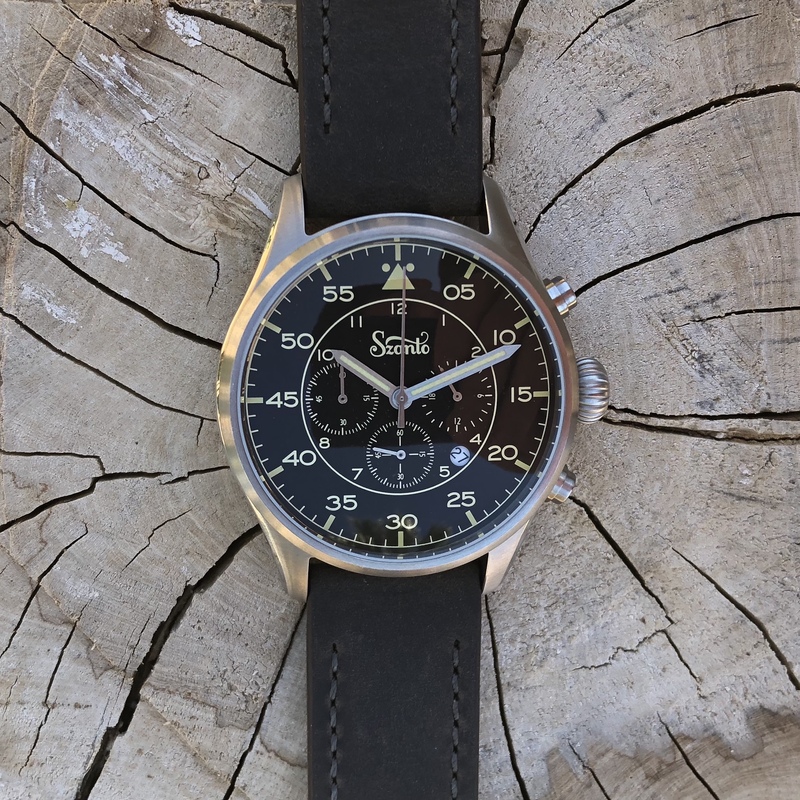 Part of the tasteful look of the Szanto Heritage Aviator comes from the vintage styling elements, most notably the tan-on-black dial and the onion crown. The classic flieger dial with sharpened stick hands also keeps things modest. The printing on the dial could be better aligned—the larger numbers on the left-hand side make the center dials look off-center. Yet, for all the info packed into the dial, it manages to look uncluttered at a glance. The standout of the controls is the onion crown. The knurling is thick and clean, and the sunburst finish on the tip is a nice touch. The only downside is the quartz movement doesn’t require much adjusting, so you won’t be interacting with it very often. The chrono pushers have the same sunburst finish but are otherwise simple—a welcome deviation from the ornate crown. Who’s it for? Burly b-uhr bros.
Would I wear it? I’d take it in a smaller size—if the dial were adjusted. What I’d change? The printing on the dial could be better aligned—the larger numbers on the left-hand side make the center dials look off-center. Standout feature? Classic flieger chrono looks at an affordable price.